The Trump Administration’s November 9, 2018 order bars refugees who have not entered the United States at an official border crossing point from receiving asylum in the United States. This move violates U.S. law and treaty obligations and puts refugees with well-founded fears of persecution at risk of return to persecution. 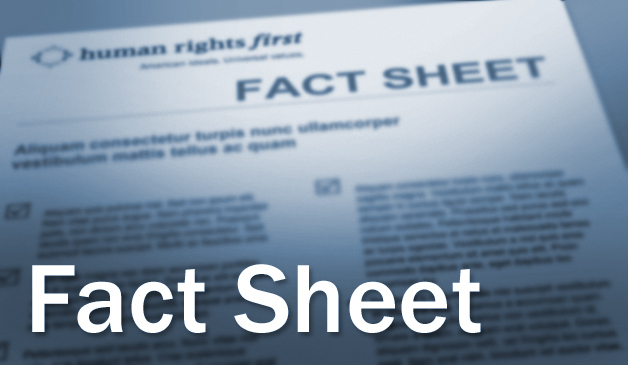 This factsheet explains withholding of removal and U.N. Convention Against Torture (CAT) protection, why these very limited forms of protection from deportation are no substitute for asylum, and how the asylum ban violates U.S. law and treaty obligations. Under U.S. immigration law, refugees who fear harm in their home country can request asylum as well as two other related forms of protection from an immigration judge: withholding of removal (INA § 241(b)(3)) or protection under the U.N. Convention Against Torture (8 C.F.R. §§ 208.16–208.18)—an international treaty banning torture, which the U.S. ratified in 1994. Asylum: To be granted asylum in the United States, an applicant must show the he or she meets the definition of a “refugee” under the Immigration and Nationality Act (INA) and that none of the bars to asylum in U.S. law apply. A refugee is defined as a person outside of his or her country who cannot return home because that person was persecuted or fears persecution because on account of his or her race, religion, nationality, political opinion, or membership in a particular social group. The U.S. Supreme Court has said that this fear may be well-founded where there is as little as a 10% chance of persecution. Withholding of Removal: This form of protection has stricter requirements than asylum. Withholding of removal protects only those refugees who can show that they would face a more than 50% chance of persecution on account of one of the protected grounds (race, religion, nationality, political opinion or group membership) if returned to their country. While some of the bars to asylum, such as the one-year-filing deadline, do not apply to withholding of removal claims, the standard to qualify is more stringent. Convention Against Torture: Protection from deportation under CAT is limited because it protects only people who fear torture—an even more severe harm than persecution. A person seeking CAT protection must establish a more than 50% chance that he or she would be tortured if returned to their home country. The applicant does not have to show the torture would be on account of a protected ground but must prove that government authorities would be responsible for the torture or would know about the torture and allow others to carry it out. Barring refugees from asylum places them at risk of deportation to persecution. A refugee subject to the ban who can establish a well-founded fear of persecution (the standard for asylum) but who cannot meet the stringent requirements for withholding of removal or CAT protection would not receive fear-based protection from deportation. For instance, an immigration judge who finds that a refugee subject to the president’s order faces a one-in-three chance of persecution could not receive asylum and would not qualify for withholding or CAT protection. Yet, the United States joined the Refugee Protocol, and Congress adopted the Refugee Act, to ensure that refugees with well-founded fears of persecution would not be deported. Further, refugees who have suffered severe past persecution, including torture, will not qualify for protection under the ban unless they show that they fear future harm that is more likely than not to occur—a high standard that not all will be able to meet. Indeed, immigration courts grant withholding of removal and CAT protection in limited circumstances. In fiscal year 2016, the immigration courts granted only 6% of withholding applications and less than 5% of adjudicated CAT cases. Those refugees granted withholding and CAT protection are left in long-term legal limbo. In fact, the immigration judge enters an order of removal but simultaneously freezes the deportation by granting withholding of removal or CAT protection. While the refugee cannot be returned to the country where the immigration judge has found he or she is more likely than not to be persecuted or tortured, the refugee has not been granted any immigration status. The government sometimes continues to detain these refugees and can try to remove them to another country.